The cherry blossom trees in Ueno Park are nationally famous, and rightly so, commonly known as Ueno Park’s Chuo Street the scenes in late March and early April are truly spectacular. The exact dates are a bit tricky to predict exactly but the festival is scheduled to run between 21st March and 7th April in 2019. Full bloom is expected around the last weekend in March. Groups of friends and families gather to sit on ground sheets and blankets under the blossoming sakura trees, eating and drinking to celebrate the arrival of spring. There are up to 100,000 visitors each day when the cherry blossom is in full bloom so can get a bit hectic if you do not have a spot reserved to sit and relax, but at night there is a real party atmosphere. Remember to bring a jacket if you staying after dark because it gets pretty chilly as soon as the sun dips. 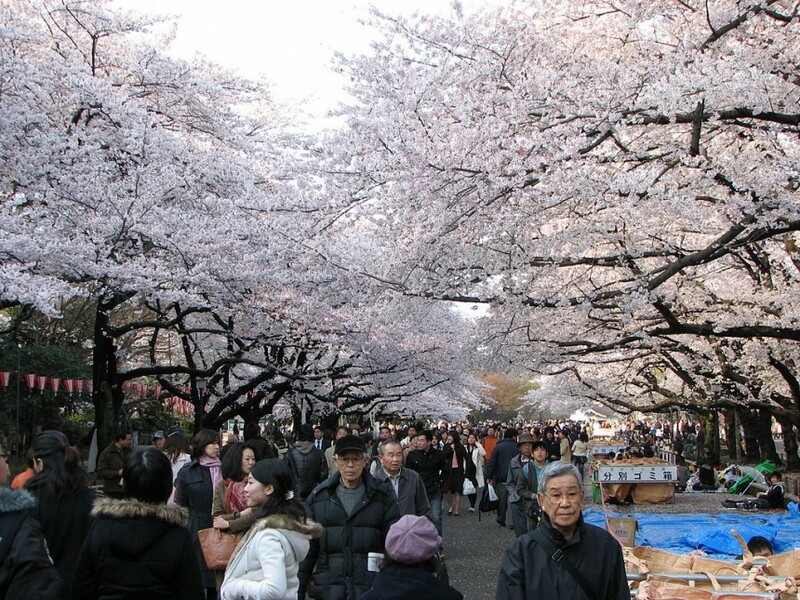 There is a long history of cherry blossom viewing in Ueno park going back to the edo period. It is mentioned in famous Japanese novels and old photographs of the city. In the festival, 1000 bauble style lights are hung, playing a part in crime prevention, and helping to illuminate the cherry blossoms at night bringing out the atmosphere of the party.